Perfect for a period costume or theater! 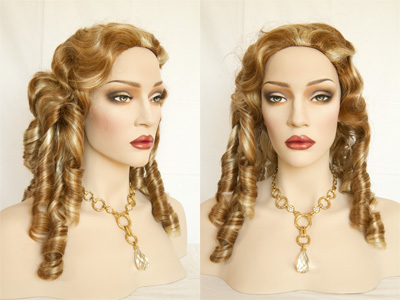 This stunning premium quality, mid-length wig, reminiscent of the 1800's will complete your look. Featuring lovely finger waves and locks which fall just past the shoulder! The hair is made from the finest Eleora fiber. Wig Secret features premium quality, natural looking wigs which are adjustable to fit most head sizes. Other colors can be ordered, Please allow 1 week for delivery on extra colors.